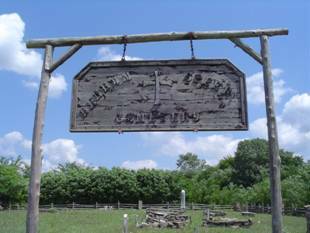 The Benham-Hughes-Speer cemetery is encompassed within the Ross Creek Landing golf course in Clifton, Tennessee. It can be accessed from Tom Holt Rd. or from the golf course club house. Travel west from Waynesboro, Tennessee on US-64 and turn right onto highway 114. Travel for 4.7 miles and turn right onto Tom Holt Rd. After traveling for about ¼ mile, look to your left and it is on the hill above the fairway and cart track. If one chooses to walk from Tom Holt Rd., respect the golfers, as there may be several in the immediate area. Also, there are snakes in the area. An alternate route is to go to the club house, rent a cart and drive to the cemetery. Again, respect the folks playing on the greens. If one chooses to go this route, drive from Clifton on highway 128 for about one and one half miles and turn right onto Airport Rd. Turn right again and travel to the club house parking area. There are several locations with limestone rocks that are probably markers for other graves. One area has what appears to have once been a pile of stones marking two graves. Those are level with the ground now. There are a few graves that have rocks stacked with no identification. 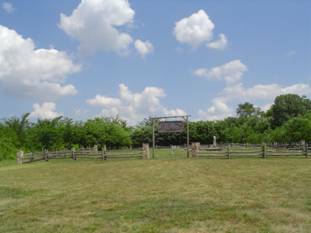 The cemetery has stone columns and a rail type fence surrounding it. Edmiston, Mary E.; b. 09 Mar 1848, d. 15 Aug 1856, daughter of E.F. & M.J.
Speer, Elliott A.; b. 28 Nov 1836, d. 28 Jun 1837, daughter of R. & M.
Speer, Henry C.; b. 14 Jul 1846, d. 10 Oct 1855, son of R. & M.
Speer, Martha; b. 23 Dec 1806, d. 27 Aug 1856, wife of Robert A.
Speer, Robert A.; b. 23 Oct 1848, d. 30 Aug 1856, son of R. & M.
Speer, Sarah Ann; b. 11 Sep 1822, d. 27 Sep 1852, daughter of R. & M.
Stone, Robert Hardeman; b. 12 Dec 1854, d. 01 Jan 1855, son of J.W. & C.M. * This marker was badly broken, however, this enumerator believes it to be a Hughes. This grave is beside Sarah Margaret Jane Hughes.